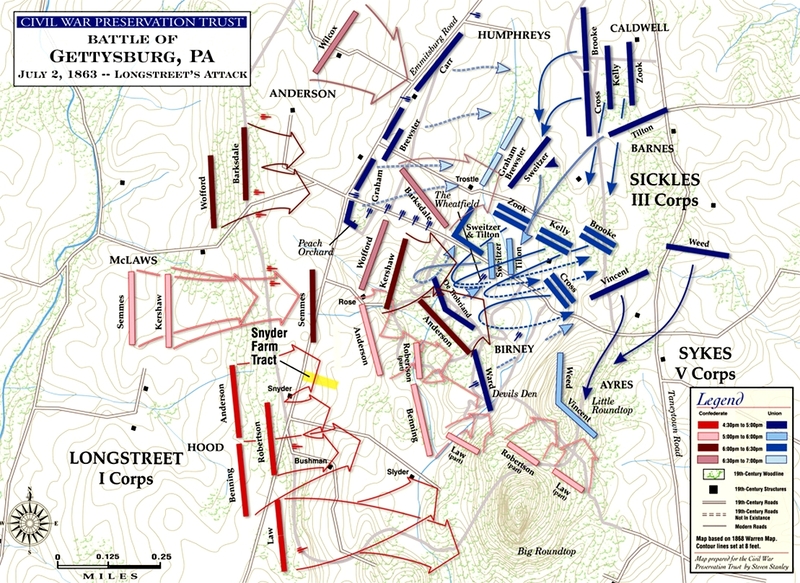 The second day’s battle of Gettysburg was the largest and costliest of the three days. The second day’s fighting (at Devil’s Den, Little Round Top, The Wheatfield, The Peach Orchard, Cemetery Ridge, Trostle’s Farm, Culp’s Hill and Cemetery Hill) involved at least 100,000 soldiers of which roughly 20,000 were killed, wounded, captured or missing. The second day in itself ranks as the 10th bloodiest battle of the Civil War. Devils Den, a boulder-strewn Gettysburg Battlefield hill, was used by artillery and infantry (e.g., snipers) during the second day of the Battle of Gettysburg, July 2, 1863. On July 2, 1863, Smith's Union battery used the hill to counterfire on Confederate artillery prior to McLaws' Assault at 5:30 pm. Against Hood's Assault that started at 4 pm, Devils Den was defended by Birney's 1st Division as the far left position from The Peach Orchard Salient of the III Corps. The hill was captured when the "First Texas Regiment, having pressed forward to the crest of the hill and driven the enemy from his battery", and Anderson's Confederates used the hill for the first attack on The Wheatfield. 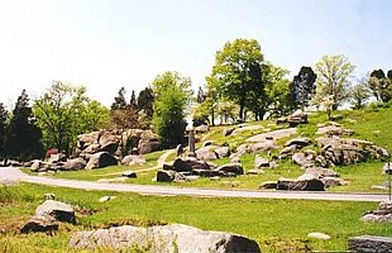 From near the Slaughter Pen, the 40th New York Volunteer Infantry Regiment forced the 2nd & 17th Georgia regiments of Benning's Brigade to retreat to Devils Den. Located 900 yards west of Little Round Top, this unique landmark lies at the southern end of a forested ridge that separates Plum Run Valley from the Wheatfield. Considered a curiosity by local residents long before the battle, the huge granite formations and steep cliffs of Devil's Den provided height and protection for the Union battery placed on the summit. On the afternoon of July 2, Captain James Smith's 4th New York Battery was stationed here on the extreme left of General Sickles' advanced Third Corps line. From the summit, Smith could survey the Slyder and Bushman farms up to Warfield Ridge where Longstreet's Confederates readied themselves for the afternoon attack. Though the position Smith held appeared formidable, there was a major weakness- there was only room for four of Smith's six guns and no place to safely park the artillery limbers that carried the ammunition chests. Ammunition would have to be run up the steep hill from the limbers parked on the eastern side of the den. With guns and gunners crowding the summit, there was precious little room for anything else including infantry support. Smith and his officers hoped that if the Confederates attacked, they would do so on the west side through a triangular field and not from another direction. Otherwise, they would be trapped. Smith's worse fears came true when Confederates struck the den from three directions at once. Southerners were awe struck by the terrible nature of the ground. One veteran of the battle described it as, "a wild, rocky labyrinth which, from its weird, uncanny features, has long been called by the people of the vicinity the 'Devils Den.' Large rocks from six to fifteen feet high are thrown together in confusion over a considerable area and yet so disposed as to leave everywhere among them siding passages carpeted with moss. Many of the recesses are never visited by the sunshine, and a cavernous coolness pervades the air within it." Pastures around the base of the Den were filled with piles of rocks and large boulders that caused battle formations to fragment. Officers lost control of their commands and soldiers lost their way in this wild garden of stone. Men scrambled behind boulders for protection from the shower of bullets, shell and canister. The 4th New York initially dueled with Confederate batteries near the Emmitsburg Road three quarters of a mile to the west until Confederate infantry from Brig. General Jerome Robertson's brigade and Brig. General Henry L. Benning's brigade closed in on their position. The fighting was at close range. 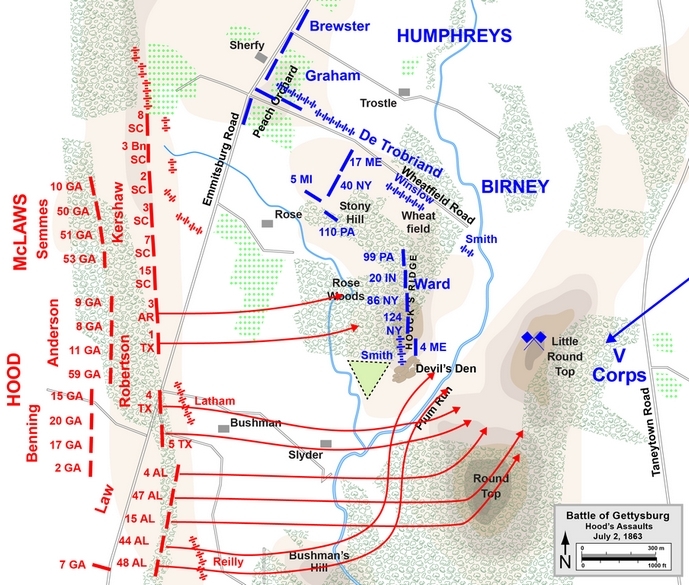 Repeated charges by the 15th Georgia and the 1st Texas Infantry through a triangular-shaped field on the west side of Devil's Den wore down Smith's artillerymen. When it appeared that the guns were in danger of capture, a desperate counterattack by the 124th New York Infantry stalled the Southern assault. The aggressive Union defense made General Robertson believe that he was outnumbered six to one, but he rallied his Texans with the 3rd Arkansas Infantry for one last effort. At this same time, Confederates were successfully driving into the Union rear around the den. With no help in sight and his infantry support withdrawing, Smith knew he would lose his guns. "The men are instructed to remove all implements if they are compelled to fall back, so that our pieces may not be turned against us. Alas, we are flanked by the enemy moving through the gorge (and) our pieces are now useless." Shouting the famous rebel yell, the 1st Texas charged up the triangular field to finally take the summit. 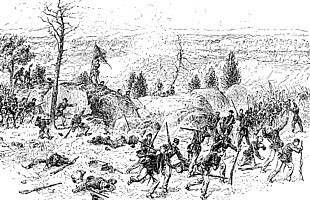 Georgian and Texan alike swarmed over Devil's Den and took three of Smith's guns as prizes. One enthused Texan stood upon one of the cannon and triumphantly waved the flag of the 1st Texas at the retreating Northerners. Captain Smith raced to his last two guns stationed on a small knoll in the Valley of Death: "I run with all speed in me and open fire with these two guns on the troops coming through the gorge. Their battle flag drops three times from the effect of our canister. Their line wavers and seeks shelter in the woods, but in a moment they return in a solid mass. The 6th New Jersey moves forward across my front, then the 40th New York passes through the park of horses and carriages stationed near (our) position and attacks Benning's Brigade." Between Devil's Den and Big Round Top the valley narrowed into a boulder-choked gorge cut by a slow moving stream called Plum Run. Rushed into the marshy valley, Union infantry battled Alabama and Georgia troops who had swept around the Den to threaten the Union rear. With sword in hand, Colonel William F. Perry ordered his 44th Alabama Infantry to charge through the gorge: "I received an order to capture the battery at the Devil's Den. I at once resolved to make the attack from the woods south of the battery. My regiment, which was near the center, was thrown to the left by an oblique march... wheeled so as to face to the north, and at once moved upon the point of attack. As the line emerged from the woods into the open space, a sheet of flame burst from the rocks less than a hundred yards away. A few scattering shots in the beginning gave warning in time for my men to fall flat, and thus largely escape the effect of the main volley. No language can express the intensity of the solicitude with which I surveyed the strange, wild situation which suddenly burst upon my view. Before the enemy had time to reload their guns a decision was made. Leaping over my prostrate line, I shouted the order 'Forward!' and started for the rocks. The response was a bound, a yell, and a rush..."
(Right) Union retreat from Devil's Den; drawn by Alfred Waud after the battle. Battles and Leaders. The battle lines surged back and forth until the outnumbered Union troops were forced to retreat. 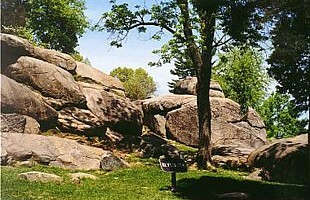 One wing of 44th Alabama rushed to the summit of Devil's Den where Major George Cary planted the regiment's flag among the boulders. "A few minutes later," Colonel Perry recalled, "the Major found me among the rocks near the foot of the hill, prostrated by heat and excessive exertion (and) exhibited an armful of swords as trophies of his victory." In the hands of the Confederates, Devil's Den soon became a haven for Confederate sharpshooters who practiced their deadly craft on Union targets on Little Round Top. As the battle for Devil's Den raged, the last brigade of General Hood's Division charged toward the Wheatfield. 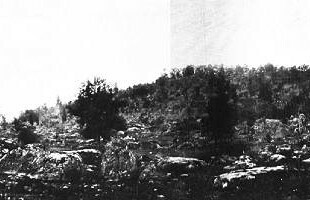 (Left) Little Round Top from Devil's Den, taken by Timothy O'Sullivan on July 6, 1863. Library of Congress. After the battle, the area between Devil's Den and the Round Tops was nicknamed "The Slaughter Pen," and Plum Run Valley was referred to as "The Valley of Death." The names have remained to this very day. Dead of both armies littered the landscape and it was over a week after the battle ended before all of the bodies were buried. Twenty years later this area had become one of the most heavily visited sites on the battlefield. Hundreds of visitors tramped over the area and thrilled themselves climbing over the large boulders of Devil's Den or exploring the small coves of Plum Run. Gettysburg photographer William Tipton established a photo gallery here at the Slaughter Pen where he sold battlefield photos to these early tourists and took their images perched among the boulders in Devil's Den. Tipton was later contracted to photograph the work performed by the park commission of the United States War Department, which laid out the avenues and placed many of the position markers in the park. By the turn of the century, a group of entrepreneurs had constructed the "Gettysburg Electric Railway" through this portion of the battlefield. The rail line transported tourists aboard an electric trolley car to and around Devil's Den, through the Valley of Death, and across the base of Little Round Top. The controversial trolley was finally removed after 1915, but the old rail bed is still visible today. Devil's Den was the extreme left of the III Corps line, manned by the large brigade (six regiments and two companies of sharpshooters, 2,200 men in all) of Brigadier General J. H. Hobart Ward, in Maj. Gen. David B. Birney's division. It was the southern end of Houck's Ridge, a modest elevation on the northwest side of Plum Run Valley, made distinctive by piles of huge boulders. These boulders were not the direct avenue of approach used by the Confederates. The 3rd Arkansas and the 1st Texas drove through Rose Woods and hit Ward's line head-on. His troops had lacked the time or inclination to erect breastworks, and for over an hour both sides participated in a standup fight of unusual ferocity. In the first 30 minutes, the 20th Indiana lost more than half of its men. Its colonel, John Wheeler, was killed and its lieutenant colonel wounded. The 86th New York also lost its commander. The commander of the 3rd Arkansas fell wounded, one of 182 casualties in his regiment. Meanwhile, the two regiments from Law's brigade that had split from the column advancing to the Round Tops pushed up Plum Run Valley and threatened to turn Ward's flank. Their target was the 4th Maine and the 124th New York, defending the 4th New York Independent artillery battery commanded by Captain James Smith, whose fire was causing considerable disruption in Law's brigade's advance. The pressure grew great enough that Ward needed to call the 99th Pennsylvania from his far right to reinforce his left. The commander of the 124th New York, Colonel Augustus Van Horne Ellis, and his major, James Cromwell, decided to counterattack. They mounted their horses despite the protests of soldiers who urged them to lead more safely on foot. Maj. Cromwell said, "The men must see us today." They led the charge of their "Orange Blossoms" regiment to the west, down the slope of Houck's Ridge through a triangular field surrounded by a low stone fence, sending the 1st Texas reeling back 200 yards. But both Colonel Ellis and Major Cromwell were shot dead as the Texans rallied with a massed volley; and the New Yorkers retreated to their starting point, with only 100 survivors from the 283 they started with. As reinforcements from the 99th Pennsylvania arrived, Ward's brigade retook the crest. The second wave of Hood's assault was the brigades of Henry Benning and George "Tige" Anderson. They detected a gap in Birney's division line: to Ward's right, there was a considerable gap before the brigade of Régis de Trobriand began. Anderson's line smashed into Trobriand and the gap at the southern edge of the Wheatfield. Trobriand wrote that the Confederates "converged on me like an avalanche, but we piled all the dead and wounded men in our front." The Union defense was fierce, and Anderson's brigade pulled back; its commander was wounded in the leg and was carried from the battle. Two of Benning's Confederate regiments, the 2nd and 17th Georgia, moved down Plum Run Valley around Ward's flank. They received murderous fire from the 99th Pennsylvania and Hazlett's battery on Little Round Top, but they kept pushing forward. Capt. Smith's New York battery was under severe pressure from three sides, but its supporting infantry regiments were suffering severe casualties and could not protect it. Three 10-pound Parrott rifles were lost to the 1st Texas, and they were used against Union troops the next day. Birney scrambled to find reinforcements. He sent the 40th New York and 6th New Jersey from the Wheatfield into Plum Run Valley to block the approach into Ward's flank. They collided with Benning's and Law's men in rocky, broken ground that the survivors would remember as the "Slaughter Pen". (Plum Run itself was known as "Bloody Run"; Plum Run Valley as the "Valley of Death".) Col. Thomas W. Egan, commanding the 40th New York, was called on by Smith to recover his guns. The men of the "Mozart" regiment slammed into the 2nd and 17th Georgia regiments, with initial success. As Ward's line along Houck's Ridge continued to collapse, the position manned by the 40th became increasingly untenable. 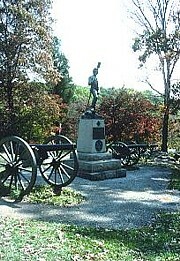 However, Egan pressed his regiment onward, according to Col. Wesley Hodges of the 17th Georgia, launching seven attacks against the Confederate positions within the boulders of Slaughter Pen and Devil's Den. As the men of the 40th fell back under relentless pressure, the 6th New Jersey covered their withdrawal and lost a third of its men in the process. The pressure on Ward's brigade was eventually too great, and he was forced to call for a retreat. 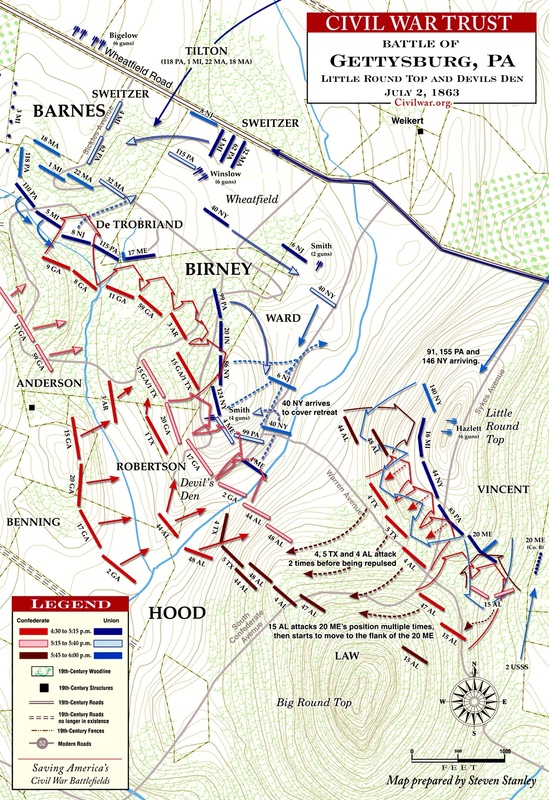 Hood's division secured Devil's Den and the southern part of Houck's Ridge. 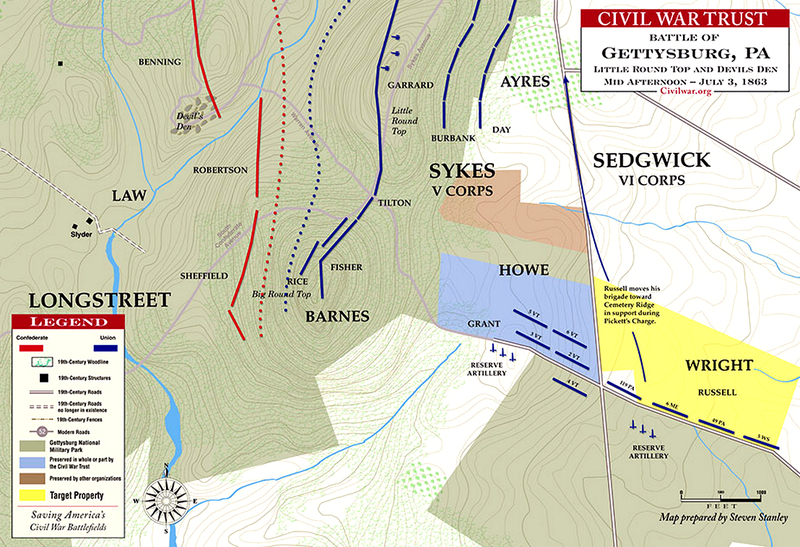 The center of the fighting shifted to the northwest, to Rose Woods and the Wheatfield, while five regiments under Evander Law assaulted Little Round Top to the east. 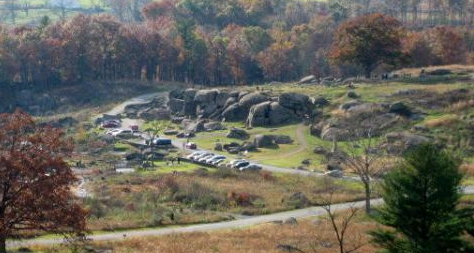 Benning's men spent the next 22 hours on Devil's Den, firing across the Valley of Death on Union troops massed on Little Round Top. The assaults by Hood's brigades were classic, tough infantry fights. Of 2,423 Union troops engaged, there were 821 casualties (138 killed, 548 wounded, 135 missing); the 5,525 Confederates lost 1,814 (329, 1,107, 378). Sources: National Park Service; Gettysburg National Military Park; Library of Congress; maps courtesy Civil War Trust, civilwartrust.org; National Archives; Official Records of the Union and Confederate Armies. Pfanz analyzes decisions and events that have sparked debate for more than a century. In particular he discusses factors underlying the Meade-Sickles controversy and the questions about Longstreet's delay in attacking the Union left. The narrative is also enhanced by thirteen superb maps, more than eighty illustrations, brief portraits of the leading commanders, and observations on artillery, weapons, and tactics that will be of help even to knowledgeable readers. Gettysburg—The Second Day is certain to become a Civil War classic. What makes the work so authoritative is Pfanz's mastery of the Gettysburg literature and his unparalleled knowledge of the ground on which the fighting occurred. His sources include the Official Records, regimental histories and personal reminiscences from soldiers North and South, personal papers and diaries, newspaper files, and last—but assuredly not least—the Gettysburg battlefield. Pfanz's career in the National Park Service included a ten-year assignment as a park historian at Gettysburg. Without doubt, he knows the terrain of the battle as well as he knows the battle itself. "Little Round Top has become iconic in Civil War literature and American memory. In the emotional recollection of our great war, if there was one speck on the landscape that decided a battle and the future of a nation, then surely this was it. The story of the July 2, 1863 struggle for that hill outside Gettysburg goes deeper into our consciousness than that, however. The men who fought for it then and there believed it to be decisive, and that is why they died for it. Glenn W. LaFantasie's TWILIGHT AT LITTLE ROUND TOP addresses that epic struggle, how those warriors felt then and later, and their physical and emotional attachment to a piece of ground that linked them forever with their nation's fate. This is military and social history at its finest." --William C. Davis, author of Lincoln's Men and An Honorable Defeat.